Welcome. This guide is meant to help you set up and configure the window manager Openbox on Ubuntu (though much of the information below will also be useful for users of other Linux distributions). You can use Openbox on its own, or as a window manager in Gnome, KDE or Xfce. This guide is meant for a stand-alone Openbox set-up. For help how to use Openbox in one of these desktop environments, have a look at the Openbox website. You can use both Gtk (Gnome) and Qt (KDE) applications in Openbox and I have tried to give both equal attention, though there are generally more solutions using Gtk apps than Qt apps. Openbox is very minimalistic and does little more than manage the windows (but does that extremely well!). This often intimidates new users, who may find Openbox too spartan or simplistic. Rather than being a flaw, Openbox’ minimalism is actually its strength. It doesn’t come with panels or desktop configuration tools, but, as you will see, there are plenty of applications available that accomplish such tasks very well. You can pick and choose whatever you like best. By doing less, Openbox thus gives you more control, and the option to turn your desktop environment into something that is exactly what you like it to be (or at least close). I mention a lot of applications in the following pages, and often mention some configuration options. I recommend reading the manual pages of whatever application you are interested in (open a terminal and type ‘man nameoftheapplication‘; press ‘q’ to exit) as you’ll find plenty more options to try out. The websites of the applications often give helpful guides as well. If an application has a website, I have linked to it. Many applications are much more configurable than they initially appear to be! Explore and settle on the configuration that suits you best. I have tried to give guidelines for doing things both from the command line and a graphical interface (using file managers, text editors, etc.). Pick whatever method you prefer. In the end, they both accomplish the same thing. For those who may find it useful, I have uploaded my own Openbox configuration files. You can access the rc.xml file here, and the menu.xml file here. There is nothing very special about them (other than that they work for me), but I have learned a lot and gathered many ideas from looking at the configuration files of other users; perhaps you will too. If you’ve never used Openbox before and are wondering what it can look like, behold some of my screenshots here. Special thanks also to those that have helped me discover Openbox and offered assistance when problems arose: fuscia, K.Mandla, moore.bryan, bonzodog, ynnhoj, and raublekick (all from the Ubuntuforums), and the folks on the IRC #openbox channel. A lot of their instructions, guidelines and ideas are incorporated into this guide. The latest version of Openbox (3.4.7) is not in the Ubuntu repositories. Though it is much easier to install the Openbox version that is in the repositories (3.4.6 in Hardy), the latest version has plenty of features that make it worth it to do it the (slightly) harder way. The first command will install some basic packages that you need to compile and install applications from source. I’ve added checkinstall, as it is a useful tool to install packages compiled from source in Ubuntu. Checkinstall creates a .deb package and installs that. This allows you to remove the application very easily using apt or Synaptic. If you prefer not to use it, leave it out and replace ‘sudo checkinstall‘ with ‘sudo make install‘ everywhere below. The second command tells apt, the package manager of Ubuntu, to install all the dependencies that are needed to build Openbox. All those commands will produce a lot of output in the terminal. You can ignore all of it, unless it reports an error in which case only the first error reported is important. What do these commands actually do? The first command checks whether you have all the required dependencies installed and builds a ‘make’ file suited to your system. The ‘make’ command builds the source code with the ‘make’ file (which may take a while, so be patient), and checkinstall installs that source code using your computer’s package management software (apt/dpkg in the case of Ubuntu). On some computers that I have tried to install Openbox in this way, checkinstall would abort (‘chmod: changing permissions of `/usr/lib/libobparser.a’: No such file or directory was the reason given). If you run into this, you should be able to install it with sudo make install (instead of sudo checkinstall). If you’d still like a .deb package (to be able to remove Openbox through apt or Synaptic), you should be able to reinstall it with checkinstall after you’ve installed it with ‘make install’ without any difficulties. If all goes well, Openbox is now installed. If you use GDM or KDM, you should be able to select Openbox in the sessions menu (F10 > Sessions). If you have KDE or Gnome installed, you should also see options to use Openbox as a window manager in either desktop environment (‘KDE/Openbox’ and ‘Gnome/Openbox’). Select Openbox, and login. Now you can start the configuration. The first time you log into Openbox, you’ll be greeted almost instantly with a blank screen. This is Openbox. Right click on the desktop and you will find your root-menu. Middle click on it and you will have the client-list–combined-menu, which shows all running applications on all desktops. The ‘Exit’ entry on the root-menu is to log out of Openbox (be aware that it doesn’t ask for a confirmation and will automatically kill all running applications); ‘Reconfigure’ reconfigures Openbox, which you will need to do to apply changes you made to your configuration files. The default menu in Openbox is very bare and empty, but editing the menu is relatively easy, so don’t despair! Now you can open the menu file (texteditorofyourchoice ~/.config/openbox/menu.xml in the terminal) and start editing it à volonté. Editing the root-menu is very simple and straightforward, and is done by editing this single file. Now download the source code from the Obmenu website. Extract the package and move into newly extracted Obmenu directory with the terminal. (If you installed menumaker, run it with the command mmaker OpenBox3). You should now have a full menu available. Note that Menumaker will not overwrite existing menu.xml files. If you have already changed your menu.xml file, you’ll need to back it up, remove it, and then add the changes to the new menu.xml file Menumaker created, or force Menumaker to overwrite any existing file with the -f flag (mmaker -f OpenBox3). If you would like to use the Debian menu in Openbox, follow the instructions found here. Be creative with the menus, and make your life easier! You can enter basically any command in the command part. If the application needs administrative privileges (such as Synaptic), add ‘gksudo’ before the application command and you will be asked to give your password before you can run the program. You can create submenus for wallpapers, using Feh (see below); add entries to change configuration files (TEXTEDITOR “/path/to/text/file”) or to open certain folders (FILEMANAGER “/directory/of/choice”); you can add entries to back up documents (cp -a /original/directories /destination/directory); etc. If you like entries to turn off applications, such as panels or conky, you can create a new entry with the following command: killall nameoftheapplication. You can also use ‘pipe menus‘, menus that are automatically generated every time you select them. There are pipe menus available for Gnome’s ‘Places’, Gmail, rss feeds, mpd players, changing of themes, setting wallpapers, and much more. You can find several pipe menus and installation instructions here. When you edit your menu.xml file manually make sure to ‘Reconfigure’ Openbox (in the root-menu) so the changes become visible. Obmenu should do so automatically when you ‘Save’ the menu you are working on. If your menu file contains broken xml code, Obmenu will not start. When you launch it in the terminal, you’ll get an error message that ends with a line like this: xml.parsers.expat.ExpatError: not well-formed (invalid token) followed by the line of the menu.xml file that contains the error. Luckily Openbox 3.4.7 warns you whenever it starts or reconfigures when your menu and configuration files contain errors. You can also create custom menus, that can be launched separately from the root menu. For more info on this, see the Openbox documentation. Note that, unlike Fluxbox or Icewm, Openbox does not support icons in the menus. Once Openbox is installed and your menus are set up to your liking, you can configure Openbox further. All of the Openbox’s configuration is done in the rc.xml file in /home/USERNAME/.config/openbox. You can edit this file manually, in your chosen text editor, but you can also use Obconf to change many of the settings in that file. The latest version of Obconf is in the Hardy (and Gutsy-backports) repositories, but you won’t be able to use it, as it has been compiled for the older versions of Openbox. You will, in other words, have to build it yourself from source. Note that if you already you have Obconf installed you will also need to recompile it to be able to use it with the latest version of Openbox. The many options in Obconf should be fairly straightforward. The dock of the rightmost tab is the place where you can load ‘dock apps’, such as system trays, launchers, pagers, clocks, etc. (more info about these below). Not all settings in the rc.xml file can (at present) be changed with Obconf. You’ll have to edit the rc.xml file for those. A= Alt, C= Control, W= Windows key. Escape= escape key, Delete= delete key. If you want to use a particular key, but are unsure of its name, you can use xev to find out what it is called: type xev into a terminal and then press the key you want to use. A lot of information will appear; you need what comes after ‘keycode’. This will launch the file manager Thunar and prompt osdsh to display the text “Thunar” on my screen. For more information on keybindings, have a look at the Openbox documentation. If you’re insterested in my keybindings, have a look at this post. The next section in the rc.xml file concerns the mouse. It governs the things that happen when you click, drag or press a particular mouse button in a particular area. For more information, have a look at the Openbox documentation. For some examples of what you can do with both keybindings and mousbindings, have a look here. Everytime you now run xfce4-terminal, it will open on workspace 3, maximized, without window decorations, but below all other applications. When you change your rc.xml file make sure to ‘Reconfigure’ Openbox (in the root-menu) so the changes take effect. The changes made through Obconf should appear immediately. Changing the theme for Openbox is very simple. Open Obconf, and select the theme of your choice. To install new themes, you can either use the option in Obconf to install an .obt archived theme, or just extract the theme archive to /home/USERNAME/.themes and then select the theme in Obconf (you’ll have to restart Obconf if it was running before you copied the theme files there). Alternatively, you can edit the rc.xml file manually to change the theme (search for “theme”). Good places to find more Openbox themes are Box-look.org and Freshmeat.org. 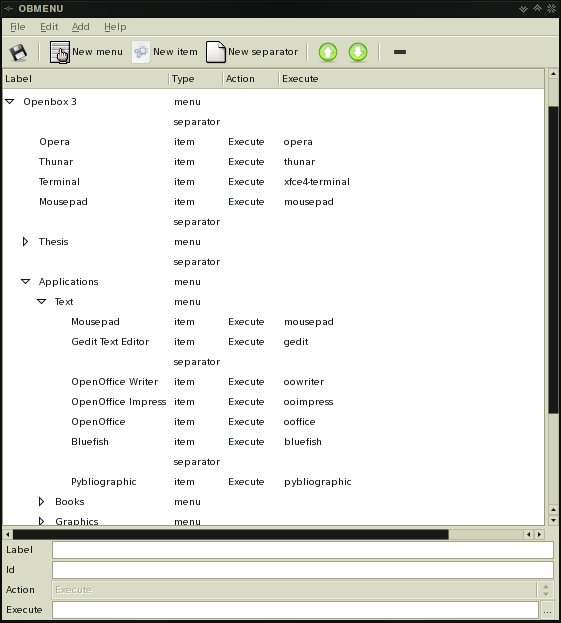 There is also a package called openbox-themes in the Ubuntu repositories that contains a large number of Openbox themes. 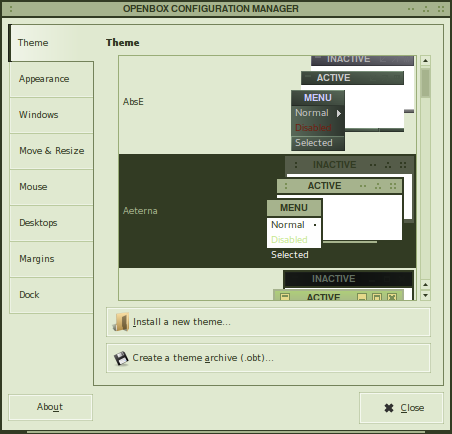 You can easily create or modify your own Openbox themes. For more info on this, have a look at the theme options. LXappearance, Gtk-theme-switch and Gtk-chtheme are three small applications that enable you to change the Gtk themes and fonts. Of these three, LXappearance has the most options: it can set the Gtk themes, fonts and icons. Gtk-chtheme is a little more polished than Gtk-theme-switch, though Gtk-theme-switch allows you to change both Gtk-1.2 themes (using ‘switch’ as command) and Gtk-2.0 themes (using the command ‘switch2’). Both allow you to change the Gtk theme and font, but neither allows you to change the icon theme, for which you will have to use the second method (below). All three offer a preview window. They save the theme information in the ~/.gtkrc-2.0 file (see below). Gtk-chtheme and Gtk-theme-switch are in the Gutsy and Hardy repositories. Earlier versions of Ubuntu only have Gtk-theme-switch in the repositories. LXappearance can be downloaded from Sourceforge.net. You can force all Gtk applications to use a particular theme, icon and font by specifying those in the /home/USERNAME/.gtkrc-2.0 and /home/USERNAME/.gtkrc.mine files. Change ‘Sans’ and ’10’ with the font name and size of your choice. Make sure the name of your icon theme matches the name of the folder where they are stored, either in /home/USERNAME/.icons or /usr/share/icons/, or it will not display. gtk-toolbar-style   = GTK_TOOLBAR_BOTH	#Both icons and text; default, used if nothing is specified. Note that the settings in the ~/.gtkrc-2.0 file will affect all Gtk applications run with your username, even when logged in another window manager or desktop environment. Note that these changing these settings will also change your Gtk settings in Xfce. 4. Use the Gnome settings. If you add ‘gnome-settings-daemon &’ to your autostart file (see below), all Gtk applications will use the Gtk theme, icons and fonts specified in the Gnome settings dialog. To change these, just start ‘gnome-control-panel’ (To make things easy, add an entry in your Openbox menu for this). Gnome-settings-daemon controls more than just the Gtk theme and the wallpaper: it also governs keyboard settings, mouse settings, etc. Gnome-settings-daemon will therefore override any changes you try to make to these settings with commands like xset in your autostart.sh file, though you can change those settings through gconf-editor. Note also that these changing the settings of gnome-settings-daemon will also change your Gtk settings in Gnome. To control and change the theme settings of Qt or KDE applications, you can use Qt3-qtconfig (for Qt3) or Qt4-qtconfig (for Qt4). It allows you to change the Qt theme and fonts. The theme configuration options it offers are rather limited, though, and you can also not use it to change the icon theme. For more control, you’ll have to rely on the robust Kcontrol, which governs every KDE setting (but note that this carries some heavy dependencies!). Qt themes are more complex than Gtk themes, and are therefore harder to change through text files than Gtk themes are. But if you want to edit the Qt theme settings manually, you can do so in ~/.qt/qtrc. In that folder, you can also specify or edit the Qt theme engine settings. You can change the icons in ~/.kde/share/config/kdeglobals. Earlier I mentioned how you can set the Openbox, Gtk and Qt fonts, but if you don’t use gnome-settings-daemon or xfce-mcs-manager, these fonts could look rather ugly. How can you have sharper, antialiased fonts without the use of these daemons? The font configuration for X is done through a single xml file, either /etc/fonts/fonts.conf (default, system-wide) or in ~/.fonts.conf (you can create this file if it doesn’t exist yet). The Arch Linux Wiki has an excellent page detailing what to do with this file; at the bottom of that page, you’ll also find a sample fonts.conf file you can experiment with. If you want to use the artwiz fonts in your Gtk, Qt or Openbox themes, this post will help you install these fonts. What do you do when you want to change the mouse cursor theme? You can do this in two ways: system-wide, or for a single user. Change the mouse Xcursor.theme to whatever your preferred theme is named. Some cursor themes support can display more than one size; if you use such a theme, you can specify the size with the second line (normal sizes are 32, 48 or 64). If the cursor theme only has a single size, this line is meaningless. You can install cursor themes in /home/USERNAME/.icons or /usr/share/icons/. Make sure the name you specify in ~/.Xdefaults matches the name of the folder the theme is stored in (as always case sensitive). When you restart X, the new cursor theme should be applied. If you prefer graphical tools, you could try out gcursor, a Gtk application to change cursor themes (with previews). To start applications automatically when Openbox starts is very simple. You can achieve this by editing the autostart file. If you haven’t done so already, create a file called autostart.sh in /home/USERNAME/.config/openbox. In this file you can add any applications that you want to be started whenever openbox-session is started. If you do not have such a file in >/.config/openbox/ Openbox will launch the default system-wide autostart.sh script, located at /etc/xdg/openbox/. The default autostart file loads quite a lot. If sets a plain colour background, loads either gnome-settings-daemon or xfce-mcs-manager if you have them installed to govern your wallpaper and Gtk settings, and launches kdeinit if you have KDE installed so that your KDE applications start faster. If you desire, you can start the default autostart file with the following command: .$GLOBALAUTOSTART &. Make sure that you have a & after each entry, or any program after it will not run! If you want your disks and removable media to be mounted automatically, you can use Thunar’s volume manager (thunar-volman), gnome-volume-manager (as in the above example), or ivman using the command “ivman &”. If you use Thunar as your file manager, thunar-volman is the lightest as it doesn’t require an extra daemon running but is activated automatically whenever you run Thunar. If you want Thunar to load faster, you can launch it as a daemon with this file using the command thunar –daemon &. Pypanel will now load with a delay of three seconds, i.e. after Openbox has fully loaded. If you’d like your dockapps to start in a particular order, read this. Note that when you use Openbox as a window manager in Gnome, KDE or Xfce, Openbox’s autostart.sh file is not used. You’ll have to use the autostart options of the desktop environment you are using. Openbox itself does not manage the desktop, but using other applications, you can set your wallpaper in many different ways. I will illustrate two methods here at length – Feh and Nitrogen – as these are the most popular, More are mentioned at the end of this section. If you use Feh also as an image viewer, open the image, right click on it and go to File > Background and select your preferred option. If you use Thunar, you can also create a custom action (Edit > Configure custom action > ). Create a new action called ‘Set as Background’ and use the following command: feh –bg-scale %f (or tile/center/etc.) and select ‘Image files’ in the ‘Appearance condition’ tab. Now you’ll just have to right click on an image file in Thunar and select the ‘Set as Background’. If you would like to use a graphical user interface in combination with Feh, you can use CWallpaper or the simpler Oboinus. For more information on CWallpaper, have a look here (little over half way down). There are other applications as well you can use to set a desktop wallpaper, such as hsetroot, Habak, or xli. See this post for more information. To have icons on the desktop, you can use iDesk, though it only supports launchers. There is a graphical configuration tool for iDesk available, called iDesktools that should make using iDesk even simpler, but I’ve never managed to get it to work properly. Others, though, have had more success. If you want the files and directories that are in your /home/USERNAME/Desktop/ folder to show on the desktop, you can use a file manager that draws the desktop, such as PCMan-FM, Rox-filer, or Gnome’s Nautilus. Note that when some file managers, like Nautilus, draw the desktop you will also lose your right and middle click Openbox menus on the desktop. Unlike Fluxbox, Blackbox or Icewm, Openbox does not come with a panel. If you do want to use a panel, you’ll have to add one yourself, but, since you have a wide selection of panels to choose from, this allows you to have everything just the way you want it. Pypanel: A very minimalistic panel, that is light and quite configurable. Supports launchers, a system tray, a clock with time and/or date, and a workspace indicator. I give some tips on what to do with Pypanel in this post. Fbpanel: A light panel with many plug-ins (pagers, task bar, menu, clock, etc.) that follows your Gtk theme and supports transparency. You can run two panels at the same time (top & bottom), Gnome-style. Lxpanel: A light panel with all the things that normally come with a panel. Lxpanel is similar to fbpanel, but easier to configure. It is part of the the LXDE project. Perlpanel: As the name suggests, perlpanel is written in perl. It is heavier on resources than the above mentioned panels, but has a lot of extensions that can be loaded. BMpanel: A lightweight panel with a taskbar, system tray, desktop switcher and a clock. The panel is themeable. It is based on fspanel, which is no longer developed. Barpanel: A themeable panel with lots of plugins and nice menus. It is a continuation of Foopanel. I’ve had some issues with this panel (it only showed up on one workspace), but others seemed to have had more luck with it. Xfce4-panel: The panel that is used in Xfce. Everything will work in Openbox, including all the applets (clocks, pagers, launchers, etc. ), except for the power options (shut down, restart, etc.). Gnome-panel:The panel that is used in Gnome. Everything will work in Openbox, including all the applets (clocks, pagers, launchers, etc. ), except for the power options (shut down, restart, etc.). Kicker: The panel that is used in KDE. Everything will work in Openbox, including all the applets (clocks, pagers, launchers, etc. ), except for the power options (shut down, restart, etc.). Tint2: Tint2 is a continuation of Tint task manager, a text-only task list that is very configurable in looks. Tint2 added more configuration options, as well as a clock to it. It seems launcher icons are also planned for future releases. visibility: Visibility is a simple icon-box task list. A python/gtk version is also available, which will follow your Gtk2 theme. Instead or in addition of a task list, you can also use Skippy, a full-screen task-switcher that shows you the (non-iconified) windows that are running in your current workspace. docker: A very simple and very light system tray that runs in the dock. It is my favourite system tray: does what it needs to do well, without any complications. peksystray : A system tray that appears in the dock, and is a bit more configurable than docker. trayer: A lightweight GTK2-based system tray, extracted from fbpanel‘s code. It supports transparency. If you use Gkrellm, you can use the gkrellm trayicons plugin to add a system tray to it. Wbar: Wbar is a quick launch bar that is fairly configurable. It doesn’t autohide (yet), so don’t spend hours looking for that option. WMdrawer: A drawer with launchers that goes in the dock. Like most dockapps, it is quite ugly with its default settings, but its looks can easily be changed. Apwal: A simple icon-box application launcher. It is quite neat and fast and gives you quick (graphical) access to whatever commands you configure. Tablaunch: A quick launch bar that is configurable and remains hidden when not used. It is based on yeahlaunch. Simdock: A light and customizable dock, that doesn’t require compositing to work. It seems still in early stages of development, but is functional. Tabble: Tabble is “a small alternative X shell which presents your programs in tabs for easy launch” (have a look at the picture on the website; that will explain better what Tabble actually is). You can use it as a light-weight graphical menu, if you add it to your panel. Obpager: Obpager is a pager specifically designed for Openbox. I’ve never liked it, as I find the pager squares too big, but tastes vary. It is in the repositories. Netwmpager:Netwmpager is a simple pager application that can be run on the desktop or on top of all other windows. It is my favourite pager. Its size, colours and basic behaviour can be changed in a simple text file. Netwmpager supports transparency if xcompmgr is running. You can download it here. Ipager: A transparent pager with some nice touches. It has an (optional) mouse-over effect, and its colour and size can be configured. It is not in the Ubuntu repositories, and despite what the website says, you don’t need Fluxbox installed to compile this. BBpager: This is the Blackbox pager. BBpager can run in the dock, and allows some basic configuration: it can use whatever colours and size you want it to use, and the number of rows and columns can be changed. It is in the repositories. Minipager: A very minimilastic pager that represents the desktops as very small coloured squares. If you want to know what time it is in Openbox, you again have plenty of choice. Use a dock app. There are several clocks available that you can load into Openbox’ dock. The best available, in my opinion, is Lal, a great simple dock clock that is light, and somewhat configurable. You can also use bbtime and/or bbdate, two very simple Blackbox apps that display the time and date respectively; if you run them in a withdrawn mode (‘bbtime -w’ or ‘bbdate -w’) they will appear in the dock. There are also several WindowMaker dockapps available, though most are ugly. Have a look here and here. Use xclock. To make it more attractive, you can configure its colours and looks (have a look at ‘man xclock‘), and set it to display without window decorations (change the settings in Openbox’ rc.xml file). Use a desklet. Both gdesklets and adesklets have clock desklets. Use Osdsh to display the time. Use the command osdctl -c 1 and osdctl -c 0 to turn the clock on and off. Run osdshconfig to configure colours, fonts and position on the screen. Xcompmgr is quite light. The above settings consume about 1-2 MB on my laptop. If you’d like a pipe-menu to control xcompmgr from your Openbox menu, this will make you happy. The first of these makes Ctrl+mousewheel-up on the titlebar of a window increase the opacity of the window, the second makes the window grow more transparent when you do Ctrl+mousewheel-down on the titlebar of the window. Add the preferred keybindings to the rc.xml file (Ctrl+Alt+Left and Right Arrows, or whatever else you like to use to change workspaces), and use the command 3ddesk. Note that it doesn’t run too well if you are on older hardware or have limited RAM, especially when used with xcompmgr and transset. When you login next time, OpenOffice should follow your general Gtk theme. You can use a small application, called ’tile’, to tile windows in any window manager. Download the appropriate .deb package from the tile website (that website seems to be down frequently, so I’ve uploaded the source code here and the deb package for i386 here; rename the files to remove the pdf extension and turn them into .tar.gz and .deb files respectively). Once installed, all you need to tile windows is use the command ’tile’. Add a menu entry or a keyboard binding with that command, and your windows are tiled instantly. Alternatively, you can use whaw to tile a selected number of windows either horizontally or vertically, using either the entire screen, or a selected area of it. Note that cascading of windows (un-tiling) is not possible, as far as I know. Neither tile nor whaw support it. Gnome, KDE and Xfce are all able to shut down, restart, hibernate or suspend your computer without administrative privileges. Window managers, such as Openbox or Fluxbox, are unable to do this on their own. Even if you use gnome-panel or xfce4-panel, you won’t be able to use the power buttons that come with it (they depend on gnome-sessions and xfce4-sessions to work if I’ve understood correctly). Advanced shutdown applications like gshutdown or kshutdown won’t work either. In the latest Openbox release (3.4.7), you can shutdown, reboot or suspend from within Openbox with gdm-control, by telling GDM (The Gnome Display Manager) to perform these actions. If you’d like a little dialog for these options, have a look here (using PyGtk), or modify this appropriately (using Gmessage). If you are not using GDM, are not using the latest version of Openbox, or prefer not to use this method, there are two other ways in which you can perform these tasks: one that requires administrative privileges, one that doesn’t. Add the following lines to your menu.xml file, wherever you want them to be in your menu. If you want to use Obmenu, add what is specified in the “Label” part in the “Label” box and what comes between the “execute” tags in the “Execute” box. The good thing about this method is that you get some sort of confirmation before you shut down or reboot, as you’ll be asked to give your sudo password first. This might be useful to prevent your computer from shutting down unexpectedly when you accidentally press the Shut down entry in your menu. Note that you need gksu installed for this to work. Save and exit, and you won’t be needing your password to reboot or shut down. You can then add the following to your menu.xml file, wherever you want them to be in your menu. If you want to use Obmenu, add what is specified in the “Label” part in the “Label” box and what comes after “execute” in the “Execute” box. You will no longer be asked to give your password to shut down or reboot now, or be a user with administrative privileges. (Note, though, that you’ll still need to preface the command with sudo!) The downside is that you also will no longer receive any warning before your computer shuts down. If you would like a confirmation window that comes up whenever you want to shut down, have a look at this post. In Openbox you can use the system monitor from Gnome or KDE, but if you’d like something a lot more lighter have a look at Gmemusage, gPS, gTaskmanager, or htop. Conky is a light-weight system monitor that can display system information (such as uptime, kernel version, cpu and memory usage, etc) on the desktop. It is highly configurable. For examples of conky setups, have a look at this thread on the Ubuntuforums. It is in the repositories. Dzen is a “general purpose messaging, notification, and menuing application.” You can use it to display all sorts of information. Have a look at the wiki to comprehend its potential. Dzen2 is in the Hardy repositories. Like conky, Gkrellm is a light-weight system monitor. It looks a little less nice than conky can look, but you can use themes to change its looks (use the ‘Invisible’ theme if you would like to see only the stats and no borders). There are a lot of plugins available. Gkrellm is in the repositories. Light-monitor is a light transparent panel-like system monitor that can display and/or manage the volume, cpu and memory usage, network traffic, battery and power status, as well as the date and time. A component of light-monitor is light-calendar, which you can use to display a transparent calendar on your desktop (which allows you to also cycle through the next and previous months). Noteo is a little app that runs in the system tray and displays notifications. It can notify you of the status of your laptop battery, emails in your Gmail account, what mpd is playing, etc. Backstep draws icons of your iconified applications on your desktop. If enabled, it can also draw miniature versions of the iconified windows on the desktop. It is a bit rough, and since long no longer developed, but it works. It is in the repositories. Dmenu is the application menu developed for dwm and used by several other tiling window managers. It can easily be used in Openbox as well; read this post for more info on using Dmenu in Openbox. Dmenu can be used for a wide variety of things: see, for example, here for how to use dmenu with mpd, or this post on how to easily access your configuration files with it. Gmrun is a small run dialog, in which you can enter commands, application names, or files to run or open. You can easily bind it to Alt+F2 in your rc.xml file, to have it work like the run dialog in Gnome, KDE or Xfce. It is in the repositories. Gtk-tray-utils is set of little Gtk utilities that load in the system tray. It consists of gbatt (a battery status indicator), gtim (a clock), gdat (a date indicator) and gvtray (a volume control). David Barr (mulberry) made a modification of gvtray you might be interested in. OSDsh (and its component osdctl) is a little application that enables you to display all battery status, a clock, volume levels or any text on your screen. It is themeable, allowing you to change the font, colours, and position on the screen. Unfortunately, the volume control applet causes your CPU to be fully consumed on recent versions of Ubuntu. Parcellite is a light and simple Gtk based clipboard manager. There is a deb package available at GetDeb.net. Unclutter is an application that runs in the background, and hides the mouse cursor when it has not moved and no buttons are pressed and the mouse is not on the desktop. This is a useful tool if you like things uncluttered. It is in the repositories. VolWheel is a little application which lets you control the volume through a tray icon you can scroll on. It is written in Perl/Gtk2. You can download it here. Wmctrl is a command-line application that can interact with EWMH/NetWM compatible X window managers. It doesn’t add any functionality to your window manager, but allows you to control it from the command line. For an indication of its potential, see this post. Wmctrl is in the repositories. Xautolock “monitors input devices under the X Window System, and launches a program of your choice if there is no activity after a user-configurable period of time. You can use this to automatically start up a screen locker if you have left your computer unattended for some period of time. The program launched need not be a screen locker such as xlock.” See this post for how to use it with Skippy. It is in the repositories. That’s it. Now you are fully ready to use Openbox! Configure it more to your liking and needs, and don’t feel afraid to try things out. Openbox is small and light, but is highly configurable. Settle on what you like best. Where do you go from here? You can visit Planet Openbox, a feed aggregator for blogs with (some) Openbox content, or you can hang out on the Openbox IRC channel and join the active Openbox mailing list (see here for more info). If you run into problems, don’t be afraid to ask for help. There are a large number of knowledgeable Openbox users on the Ubuntuforums. If you can’t find a solution for your problems elsewhere, try the mailing list or IRC channel. I’d like to receive feedback on this guide. If you find errors or inconsistencies, if you think sections could be improved on, or you have material that could be added to it, please let me know. Leave a comment, send me a pm on the Ubuntuforums (user urukrama) or send me an email at ukdasa AT yahoo DOT com. Thank you. Thanks for the awesome guide =) I was in need of up-to-date information on Openbox, and this is exactly what I was looking for. Extremely helpful. …great job! your guide is the best. Two weeks ago I found Crunchbang Linux, a remastered Ubuntu with openbox. I really like it and want to learn more about openbox. This howto pwns asses. Keep up the good work! Does anyone know how to enable the toolbar in openbox in Ubuntu? Thank you for the gread guide 🙂 I think I’ll stick now on with Openbox. wonderful guide. thanks for sharing. just one thing: you used the wrong quotes in the settings for xorg.conf. if people copy and paste this they ruin the file and may be in trouble. in conjunction with this for quick locking..
That previous post did not format my menu.xml or rc.xml cut/pastes.. 😦 So now it doesn’t make sense…bummer. Just wanted to thank you for this excellent guide. Great detail on the guide. Excellent quality! Inspiring work, hope to see more. Thanks for this Guide. This was EXTREMELY helpful. Nice guide. I’ve just started to dabble with OB and it’s a bit different from Fluxbox which I normally use but not at all bad. sheesh this guide is hot! thx a lot. all about openbox in one place. wonderful guide. /me is very grateful. Great guide, thanx for your job! Do you mind if I translate some parts of your writing to hungarian? Just a short remark: since Gutsy 3ddesktop isn’t in the official repos anymore. The link to Pypanel is not correct. And as mojoman said, the link to pypanel’s page directs to the fbpanel’s one. Again, awesome work. This is very helpful. if one were to compile the latest openbox release, how do you update those packages if and when there are updates? Same method? Excellent guide. Thankyou very much. Following a command line install from an Alt CD, I have built up Openbox without any gnome/kde/xfce libraries. Firefox runs with olde worlde cursors. How can upgrade to Ubuntu/Xubuntu cursors, is the Human theme needed? just wanted to say, that the link to pypanel is wrong. looking to change my system around a little, and this is a great help. I’m currently in the process of switching from Metacity to Openbox, and am LOVING OpenBox’s flexibility. I think there’s something wrong with your guide tho. I don’t think that dmenu is available anymore, seeing as the link you provided gives me a 404 error. Thank you, ZeroTruths. As you noticed, dmenu finally has its own page now at suckless. I’ll update the link. Hey mate — just wanted to say thanks for this excellent walkthrough. Count me a newly-converted openboxer. PCManFM also has the ability to set a background and display icons on the desktop, but doesn’t come with a panel (for that you need to download and install lxpanel from sourceforge or the lxde website (www.lxde.org). To install icons on the desktop with PCManFM you need to add the appropriate .desktop files to your Desktop folder. Of the two approaches I find the rox one more satisfying since it gives you greater freedom in placing your icons. I just thought I would make a note for anyone who is interested in rotating background images. I used chbg once upon a time, but it conflicted with conky, which I was also using at the time, so I stopped the whole rotating background thing. Having recently switched to using dockapps for system monitoring I decided to have a go at chbg again, but it didn’t want to play this time. I have however, just written and successfully tested a bash script which allows me to use feh to cycle through a folder of images as the desktop background. It seems to work quite nicely! Thanks for great guide! I am happy fluxbox user but now I am tempted to give openbox a try. But there is one feature I would really miss – grouping windows together and adding tab to this group. Does anybody know a way to get similar functionality into openbox? PS after some more digging I know now that openbox developers are not going to add tabs into openbox itself. But is there any way to get similar functionality into openbox via some tool? I was looking for some tool that just creates window with tab-bar and allow other applications to be run inside, creating one tab for each. Thank you very much: this guide helped me to solve most of my problems. It’s a must for openbox beginners! First of all, thanks for your great resource! I would like to know how you configured bbpager to appear inside the dock? I don’t find any information on the internet on this. Really really good guide! Thank you very much! You’re a real man, man. Awesome work. Really great. That helped me a lot! Best OpenBox guide on the net. Thanks a bunch! Awesome guide ! Thanks a lot ! http://bavardage.awardspace.com/noteo/ seems to be down, however! Please update? I’ve already told you how much i appreciate this guide. Could you suggest me such an applet (i use trayer for tray management)? When you use slim as a login manager it is possible to use slim’s wallpaper as normal wallpaper. To do so, don’t set any wallpaper and just login in. Slim’s wallpaper will stay! 1 – a clock at the title bar, I picture it would be perfect at the left side of the shade, minimize, maximize and close buttons. 2 – a pipe menu to replace the system tray. Very nice, complete and detailed guide! I’ve been following your guide but when I try to install obconf and get to this command “PKG_CONFIG_PATH=/usr/local/lib/pkgconfig ./configure –prefix=/usr” I get a response of “invalid prefix”. I tried adding an extre “-” like this “–prefix=/usr” then it seemed to work. No visible errors, but I couldn’t do the command “make”. And for some reason I can’t install obconf using “sudo apt-get install obconf” because that just complains about needing to install dependencies that are already installed when I did Openbox install. And it can’t overwrite them. Any suggestion on what I can do to sort this. I’m not at home so I can’t give more accurate information. makes a big difference, wont work other wise. Fantastic guide! Thank you so much for getting me up and running. I’ve used this guide so many times and I haven’t thanked you for putting it together, so thank you 🙂 It’s been a great help and I come back to it whenever I’m installing Ubuntu on a weak system. Great work. Is it possible to have a clipboard like parcellite as a pipemenu? Wow, excellent guide! I’ve been using OpenBox now for about 2 years and really like it, and am now experimenting more and more with PekWM. A lot of information from your guide can be applied also to PekWM. Also, thank you for filling me in on the long-time-mystery of why Nautilus takes over my desktop during the times that I open it (there’s a nice tool available for Nautilus that allows you to bulk resize photos, which really comes in handy… it’s called nautilus-image-converter). The simplest way to lock the screen is using `slock` from suckless.org: . You just run `slock` (no options) and it blanks the screen until you type your password. In Ubuntu or Debian just `sudo aptitude install slock`. There is also Gnome Screensaver. Like X Screensaver you have to have it running first, then do: `gnome-screensaver-command -l`. It’s a lot less old school than xlock and xscreensaver. start it with the -root option (or for the truly adventurous both the -root and -cycle options). thanks a lot for this wonderful guide that i’ll translate as soon as possible, in italian language to all italian Linux users. it’s only exit from openbox and just like ‘logout’ session and back to gdm. Has anyone succeeded in making openbox get along with kde4 suff? Konqueror does not render properly, and the whole “use qt style and fonts in gtk applications” does not seem to work in openbox, unless I do something with “kdesudo”. Weird. Great guide. I love openbox. The joy of logging in and everything appearing instantly is very refreshing. Just a note about OpenOffice. With KDE4, you need “export OOO_FORCE_DESKTOP=kde4”. Thank you very much for offering a great guide to the community. I have just created a backup page on my Google Docs for this great guide. How do I save my desktops? I keep having to add them (I need at least 4), but when I exit they disappear. Obconf says I have four, but doesn’t seem to set them. Greate! Really healpful, thanks a lot. any way for preload gtk base library for gtk applications? (like gnome-applications, Firefox, etc..)? Yesterday, as I tried to deal with both tile and whaw, I found them quite useful for automated tiling, but sometimes they don´t behave as we expect them to, or sometimes we simply want some “irregular” tiling. And that’s where Openbox gives us the choice of manual resizing. Join that to a keybinding in your rc.xml and… well, you got a fast way of controlling the tiling. Gracias por tan buena calidad de guía! I just wanted to add that this is my absolute favourite website connected to openbox. My eee PC’s are happily serving openbox to me and the tools are used are all found via this site. Nice guide. Thanks a lot. I was looking for a way to remove window decorations for chrome, autostart applications to different desktops and this was just what I needed. Much appreciated. It is the BEST site to customize OpenBox. THANKS you very much! Awesome Tutorial, i love this. It is really amazing. Great job!!!!!!!! Thanks man, this is what I really need. Fantastic! Just started getting into Openbox. Your guide rocks! Hey guys, nice to be here! I love urukrama.wordpress.com! excellent guide , thanks for this…..
Realy nice guide about openbox wm. Thanks. That is I was looking for a customize and tune my Openbox envirement. Thank you, than you very muuch! I’m sorry but there’s something I would like to do and I didn’t found in this article (but it’s really the only thing ;). Actually, I would be able have a grid of Desktops instead of just a line (I am on ubuntu and my previous window-manager let could do it : I’m addict). Is there a solution ? Or may I have to forget this idea ? I’m an American. I would like to Set up an Animation Studio in India. Currently i’m researching for computer animators. I picked India mainly because it is lower priced as compared with U.S. I need to fully understand the procedures for starting off a business in India, especially an animation studio. Just wanted to say thanks. A very helpful guide to a noob Openbox user. Excellent tutorial to begin using openbox. wow ! this has to be one of the best openbox manuals I have ever read ! thanks a lot for putting all this on the web ! Thank you for section 10! I experienced the same thing in losing my Openbox menu by starting Nautilus. I now have Openbox, PCMan-FM, and the Avant window navigator. Yes, it looks very 90s, but I do not like this forced, upcoming Unity desktop on Ubuntu, despite the fact that coding must have taken really smart programmers. This really is a great Openbox guide. > Note that, unlike Fluxbox or Icewm, Openbox does not support icons in the menus. Your text is very clear and provides precise and up to the point information. I wished to prepare an Openbox session to stand the incoming Gnome 3 storm. I managed to get it much quicker than expected thanks to your guide. Is there a way to configure Open Box so that you can just single click on a desktop icon to launch it? Killer guide, it has helped me through many tweaks already and I’ll be coming back for more as I work through my customization. I think that people will do more than they used to. any problem will be solved successfully. good luck! Thanks very much, saved me a lot of time. I appreciate all of your work on this. It has been tremendously helpful. This is an awesome guide; I keep coming back here to help perfect my openbox config. I run Debian and decided that the default gnome GUI was a bit too heavy for my taste. Openbox rocks, and thanks very much for writing this! Thanks a lot for the wonderful guide. Super Awesome. There is another use for using it with xcompmgr which is not mentioned here in this guide: If you run xcompmgr -a (and no other options) it will not draw fancy shadows and stuff but it will instead *greatly* boost performance when moving windows and and switching between windows on the same workspace. It will enable the x-server’s hardware-accelerated compositing and applications whose windows were partially hidden will not need to be redrawn when they come into the foreground. This makes switching between windows on the same workspace happen not only fast but instantaneously, even on older hardware! (tested with an old IBM ThinkPad and open source radeon driver). This might be worth mentioning in the above section about xcompmgr. Your guide is well done! It would be great if you update this guide a bit. Some points are very outdated. If you need help in something, contact me. Typo: search for “-config” replace with “–config”. Sorry…. that didn’t work for some odd reason, anyway it’s under mouse cursor themes. I’ve been referencing this page off and on for around 3 years. Just thought I’d finally say thanks. I’m currently trying out OB on my netbook running Ubuntu, since full-fledged desktop environments, including the 2D version of Unity, are painfully slow. This guide was a great help, thanks a lot! Just one question: Can you get a Gnome Look & Feel for LibreOffice as well? I always come here for reference. Thank you mate. Thanks for this excellent tutorial. This really helped me a lot! This is the greatest article that i ever encountered about openbox. Thank you very much for your detailed analysis. Keep up good work. Thank you for all your work on this very useful guide. Still perfect for ubuntu 14.04. Congrats and thanks! Can You tell me why Openbox divided up my hard drive into four sections? 120MB Active Healthy Primary Partition, 7.45GB Healthy Primary Partition, 658.64GB Healthy Primary Partition, and 32.36GB unallocated. Can I extend all the Partitions to be one Active Healthy Primary Partition? Jim, Openbox doesn’t do that. Openbox has nothing to do with hard drive partitions. What version of Linux/Unix are you using? If you need any help, you can reach me at dennygoot@gmail.com, or you can check out my tech blog dennygoot.blogspot.com. thank you so much! great blog. If you’re looking for a really decent system monitor including date and time display, check out xmobar. It’s simply brilliant. This guide is exactly what I was looking for quite a while. Thank you for your effort to line this up and for sharing! 2017, still a great guide. For my icons I use nautilus file manager(I love appearance of gnome apps), I use nitrogen to set wallpaper initially and variety as wallpaper changer(could not get nautilus to set wallpaper). Ubuntu openbox seems heavy, so I used antix base linux , installed openbox and removed the other window managers. The result, lightweight and rock solid computer.OMG openbox! No more DEs! I´ve got a question which I believe has something to do with openbox. From time to time my mouse-pointer changes to a symbol that represents something like an arrow melted together with a loading-circle. I tried to find out something about it and believe that it means “background activity”. Whenever I open my file-manager pcmanfm in a “normal” way, i.e. by clicking on a desktop-icon or the respective symbol in the task-bar, the window immediately opens – without any mose-pointer activity. However when I start pcmanfm by clicking the key-combination “WIN-key + e” the window opens as well but with the addition of the “background-activity” symbol. That one can be seen for about 20 seconds and then vanishes. I use “firejail” (sandbox) and the associated tool “firetools”. When opening “firetools” from the menu there´s the same thing: background activity-symbol for a few seconds. But when opening via command line: no symbol whatsoever. Just to be clear: everything works fine without any delay – even with that mouse-pointer-symbol. I just want to know why that is? And: when right clicking on my desktop everything that opens via the right-click menu produces this “background-activity”-symbol.